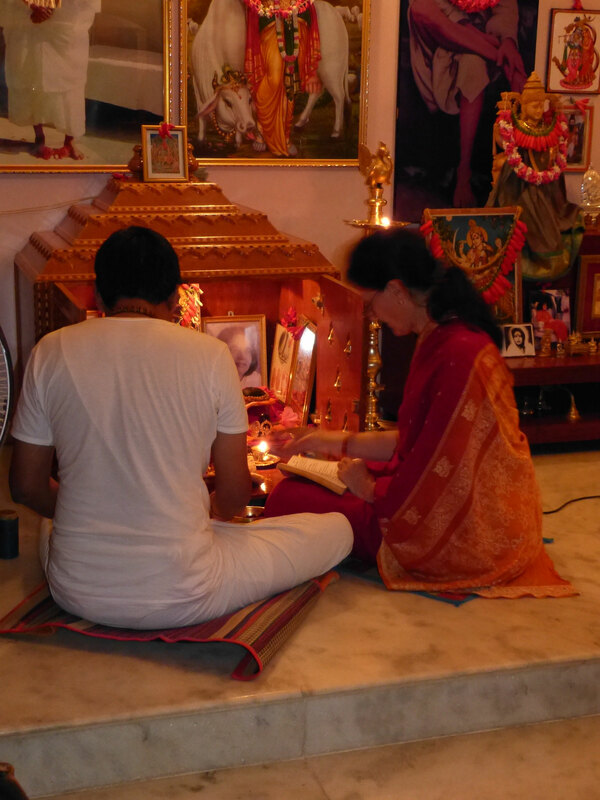 GOD ALONE IS .... at the heart of the Aum Pranava Ashram. Aum (or Om) is described as the primeval sound, the beginning of all creation. Even though people all over the world chant the sound OM, we have to acknowledge that the sound can actually only be heard, not spoken. Aum or Om is born from the density of silence. Its form is light with the splendor and brilliance of a thousand suns. Any living entity's inherent desire arising from its heart is to be happy, which is a natural expression of the latent bliss that we are carrying at the core of our being - a tremendous and vibrant ocean of blissful existence - Sat Chit Ananda. How do we express this spirit? By flooding our beings with LOVE, filling all activities with Love, and doing whatever helps us to come closer to this realization of GOD, of WHO WE REALLY ARE. 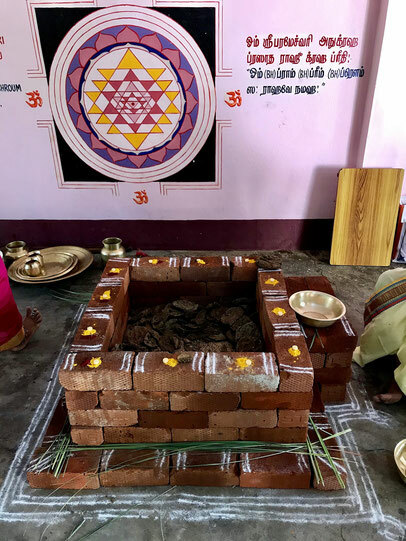 This Love for all beings finds its expression in JEEVA KARUNYAM (compassion towards all beings) which is at the core of this ashram, the very reason behind all our activities. When we have finally found this love within our own heart, life as we have known it hitherto, will change. Truth, Peace and a sense of righteous living brings lasting happiness into our life. Contentment and acceptance become a reality because we realize the transitory nature of things. True spiritual life is an ego-less way of life. 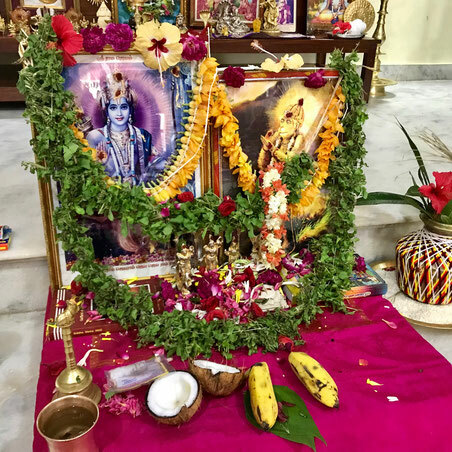 Whether we are engaged in social activities meditation or other activities, ego and narrow vision handicap the fulfillment of ones righteous (dharmic) way of living. Hence our goal is to be aware of this truth and make life meaningful by giving up false ego and narrow understanding. 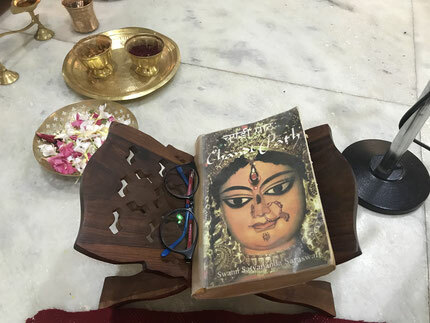 Life can become ONE by unifying thought, word and deed and by seeing all with the eyes of equanimity, without discriminating between races, castes, creeds and genders, yet following one's own unique path in a peaceful way. 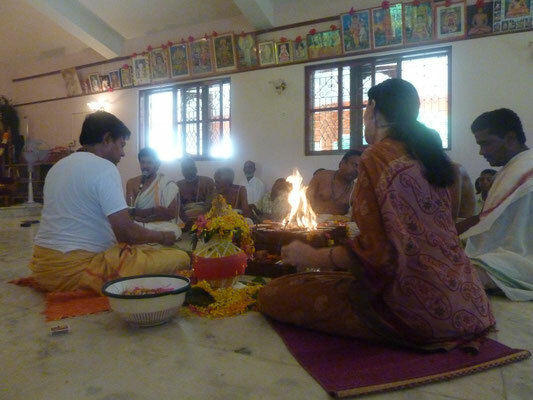 Below you can see pictures of various ashram activities which are carried out regularly like poojas, homas, ashram-specific functions like Navadina Navakoti Ramanama Japam as well as other annual functions involving Parayanam (chanting of a scripture), Pooja and Homam like Navaratri or Guru Poornima etc..
For a few hours, the Gayatri Mantra sweeps through the ashram, elevating the atmosphere and filling the space and everything in it with its prayer of adoration for the Divine Light. 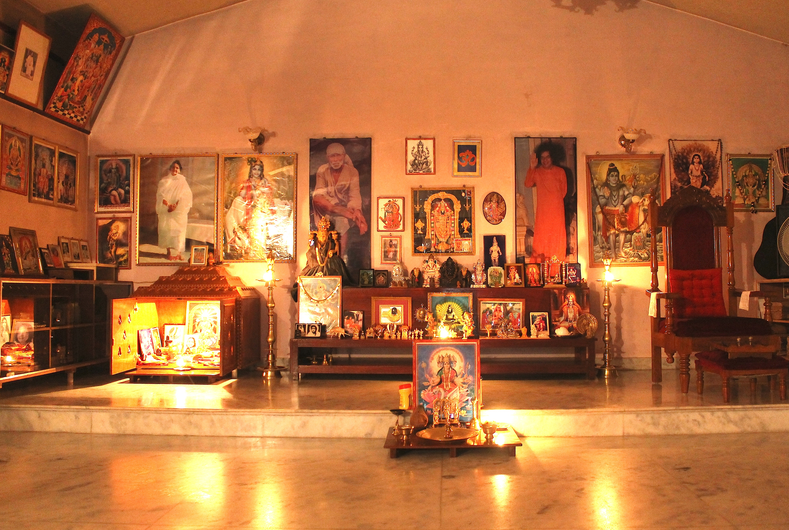 Acharya: Sri Yagnaratnam, Bhaskara Ashram, Chennai. Below: a picture of Lord Rama and His most faithful servant Hanuman. What hides behind this long name? 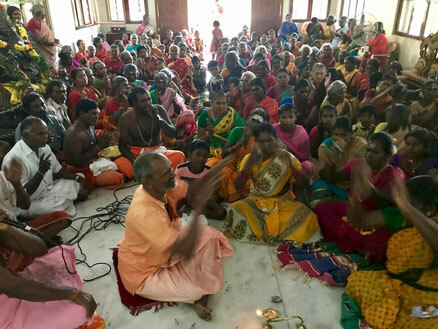 Quite simply put, it is a gathering of people devoted to Lord Rama, who love to immerse themselves in the chanting or mental repetition of the Taraka mantra, Rama. 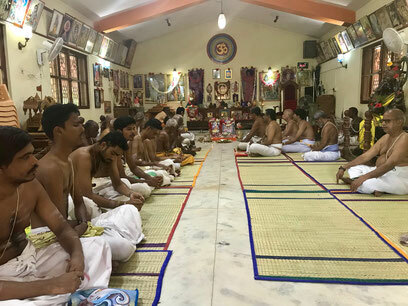 The Aum Pranava Ashram is envisaging to launch this nine-day-long festival every year for a series of twelve years (in August 2019, it will be the fourth time). People from anywhere in the world can participate, the only condition being an open heart and a yearning for truth, peace and love. 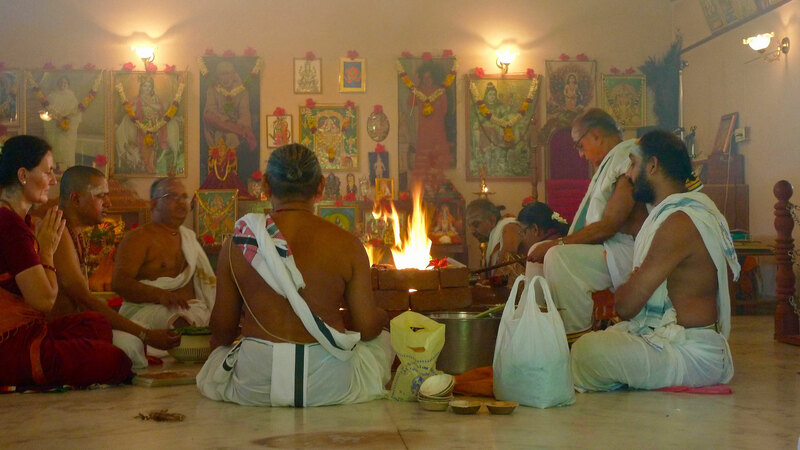 Poojas and Homas purify the atmosphere and are conducted for the welfare and protection of ALL, for all the beings in all the worlds. Om. 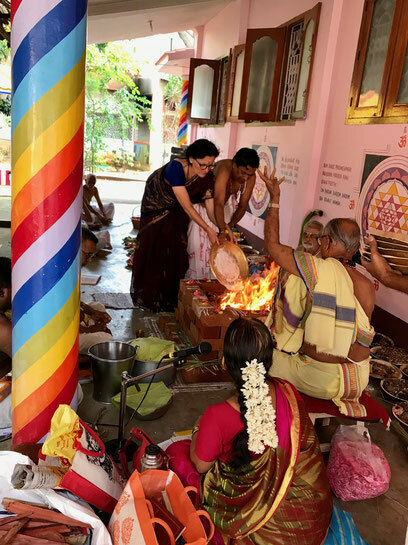 Shanthi Shanthi Shanti: (Om. Peace. Peace. Peace! Our sincere prayers go out into this world and beyond ...! Let all the beings in all the worlds be happy! Acharya: Sri Kannan Dikshithar, Tenkasi. 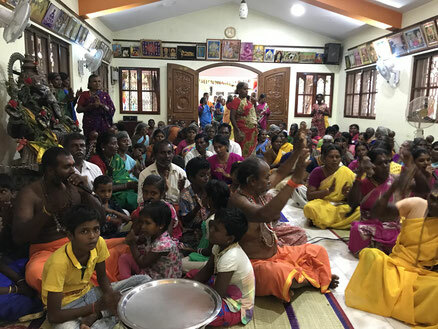 Below: enthusiastic gathering of people chanting the mantra.